The number of Australians that own a smartwatch is expected to increase, according to independent research firm, Roy Morgan Research. In a study of an estimated 520,000 Australians in the first four months of 2015, the company found 2.7 per cent said they intended to buy a smartwatch in the next year. While that might not seem like a huge number, the percentage closely mirrors the findings from another of the research firm's studies which polled respondents on if they intended to buy a then newfangled thing called an iPhone. AT the time, 3.6 per cent of the respondents indicated their interest during the first four months after it hit our shores. So could smartwatches be set to follow a similar path? According to Roy Morgan Research, possibly so, since the launch of the iPhone opened a new world where today, almost 13 million Australians have a smartphone. In addition, it found on the question of whether respondents wanted an Apple Watch or a different brand, that the number of smartwatch ‘early intenders’ today is close to the iPhone equivalent seven years ago, and the age profile is also markedly similar. 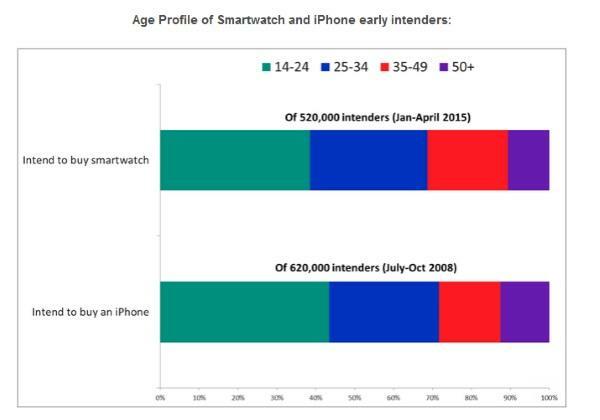 About 43 per cent of iPhone intenders in July to October 2008 were aged 14 to 24, and another 28 per cent were 25 to 34. Comparing this to today’s smartwatch intenders, 38 per cent are aged between 14 and 24 and 30 per cent are aged between 25 and 34. Roy Morgan Research media general manager, Tim Martin, said younger people drove initial uptake of smartphones, and may perhaps do the same for smartwatches. “We often talk about early adopters, but our technology research also tracks and identifies early intenders. Technology brands, retailers and marketers are therefore able to monitor adoption rates across different market segments, potentially predicting how wide and how fast uptake of new technologies will grow,” he said. The study also found that right before the Apple Watch launched, 1.2 per cent of respondents already owned a smartwatch, which Martin said was very similar to the proportion that owned a BlackBerry right before the iPhone landed. “Prior to the first iPhone release, only around 1-in-100 Australians owned a BlackBerry. Ahead of the Apple Watch release in April this year, a similar proportion of us had already got ourselves a smartwatch. “With such similarities between the two items’ early intention rates and demographics of intenders, it looks like Apple could again be opening up a whole new market with its smartwatch - despite not being the first brand to hit shelves,” he added. Roy Morgan Research said it will continue to track how many Australians have bought or intend to buy a smartwatch over the next year. Can smartphone adoption smash six billion mark by 2020?